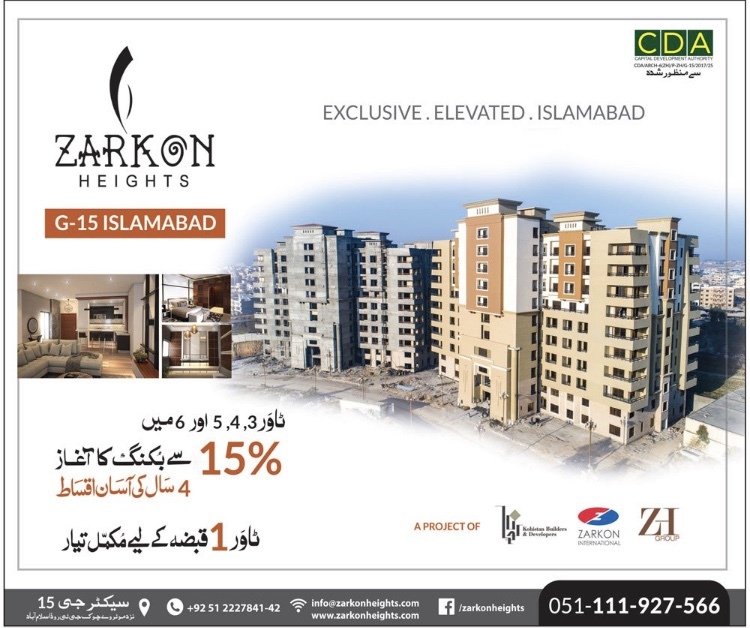 Zarkon Heights in Islamabad is the joint venture of Kohistan Builders & Developers, Zarkon Heights, and ZH group. Zarkon heights offer one bed, two bed, three bed and four-bed residential apartments with all state of the art facilities abs amenities. The project consists of several towers and two floors are dedicated to car parking area for the residents in each tower. Zarkon heights surrounded by lush green environment and easily approachable to all the major points of the city. The tower one is completed now and ready for possession. Zarkon Heights in Islamabad is ideally located at sector G-15 covered by the mountains and natural environment. It is approximately 15 to 20 minutes drive away from New Islamabad International Airport and also few minutes drive away from Lahore-Islamabad Motorway. Telephone, Drainage & Sewerage System. Almost have all Recreational Activites. Water, Gas & Electricity Available. Booking is open for all sizes of apartments and booking for apartments starts from 15% down payment and rest of the amount will be paid in 4 years easy installments.